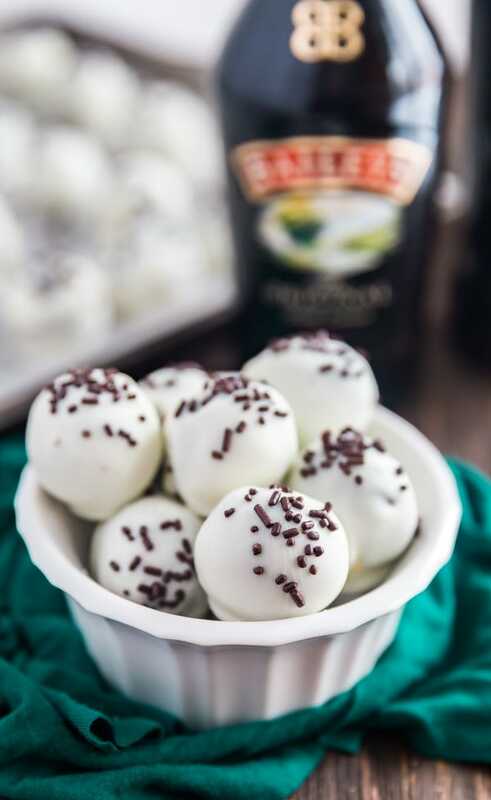 Irish Car Bomb Cake Balls Recipe turns everyone’s favorite shot into a sweet and delicious confection. 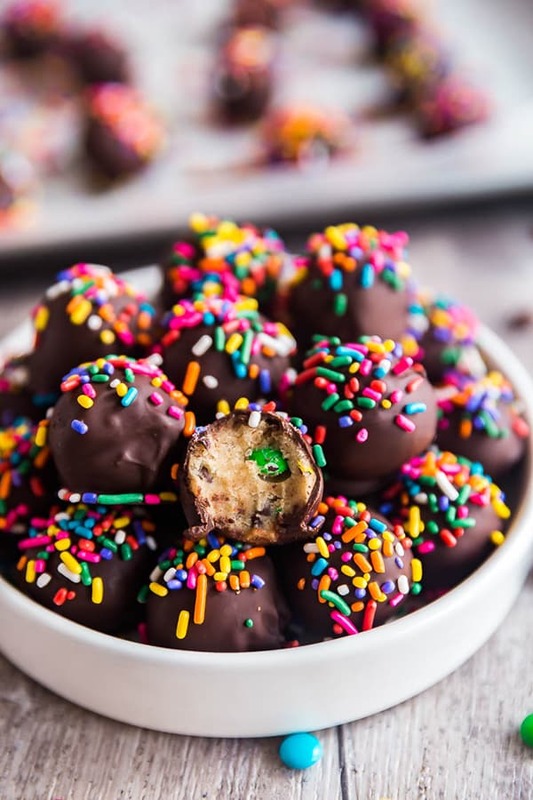 Bring these to your next party, if you don’t eat them all first! Many moons ago when I was in my early 20’s and living in NYC, I worked at an Irish Pub in Chelsea. It was a super-fun pub where I also hung out and drank a bit. It was there, that I enjoyed my first Irish Car Bomb. I was skeptical at first. And I had passed on many of these before. But I finally did it and it was love at first taste. What is an Irish Car Bomb Shot? This is a shot that has three main components. The first is a pint glass filled about half way with Guinness. The other two are Jameson’s Irish Whiskey and Bailey’s Irish Cream which are poured into a shot glass (a half ounce of each). You then drop the shot glass into the Guinness and chug it as fast as you can. This is the key to enjoying this shot because if you don’t drink it fast enough, it’ll curdle. Although the name is definitely insensitive, and although I’m not really a whiskey kind of gal (Tequila for life!!) once I tried this shot I loved it. It went down super easily and almost tasted a bit like dessert. But fun dessert, that gets you tipsy! So I figured why not turn it into real dessert? So I did just that. Not I wasn’t trying to make these too boozy. What can I say, I’m getting old! So since I’m a totally lame old lady, and not really a lover of whiskey, I did not include the whiskey in with this recipe. I know. But I’m not sorry, because these are so darn delicious. 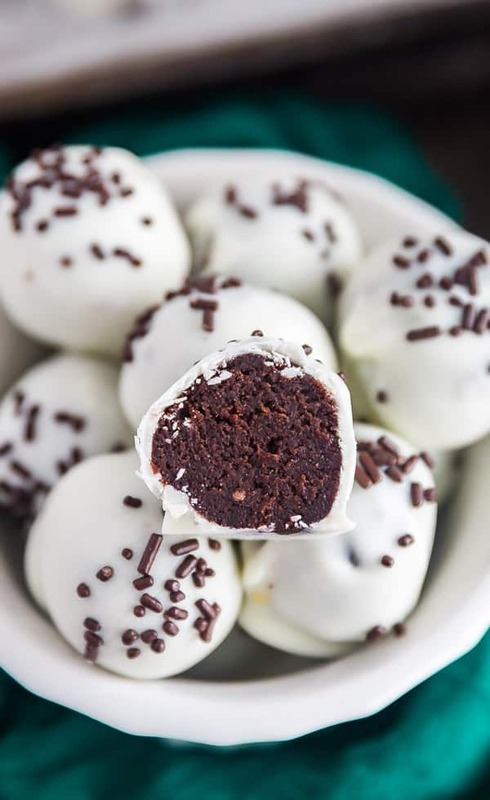 How do you make Irish Car Bomb Cake Balls? First thing you’ll do is make your favorite chocolate cake mix in a 9″ x 13″ pan. That’s right. I said to use a cake mix. Work smarter, not harder. But instead of the water in the cake mix, I want you to crack open a bottle of Guinness and substitute the exact same amount of Guinness in place of the water. And then drink the rest. Because you deserve it. Once the cake has cooled, pull all of it out of the pan and place it into the bowl of your stand mixer. Or if you don’t have one, use your hands. Run the stand mixer for a few seconds until the cake is broken down into crumbs (or crush them with your hands). Try not to steal too many bites of cake for yourself. Throw a couple tablespoons of Irish Cream into the bowl and run the mixer for a few more seconds. At this point it will come together as a dough. 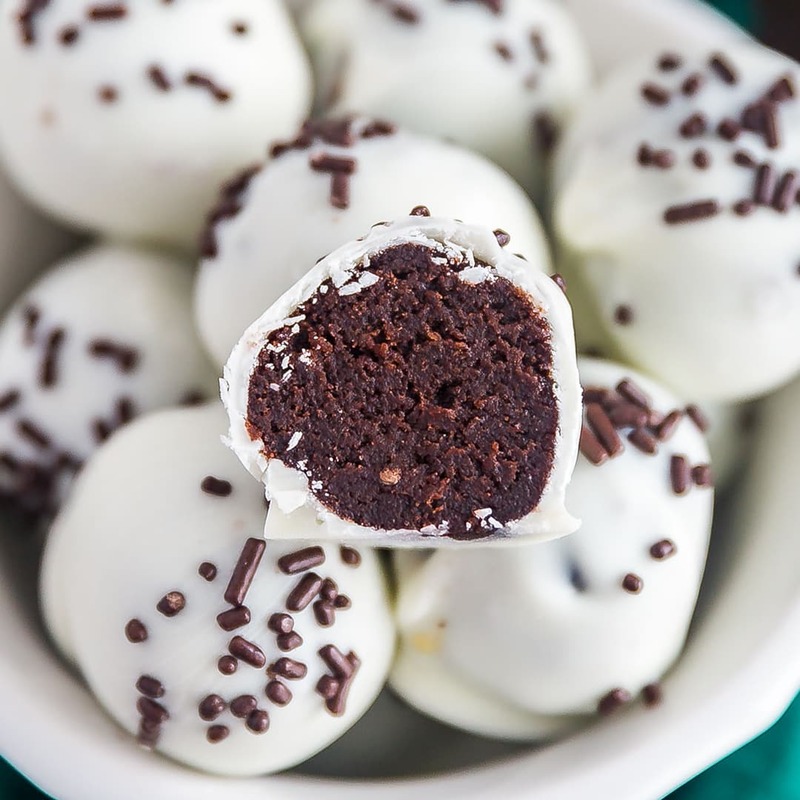 Shape them into balls and let them chill in the fridge for a bit. 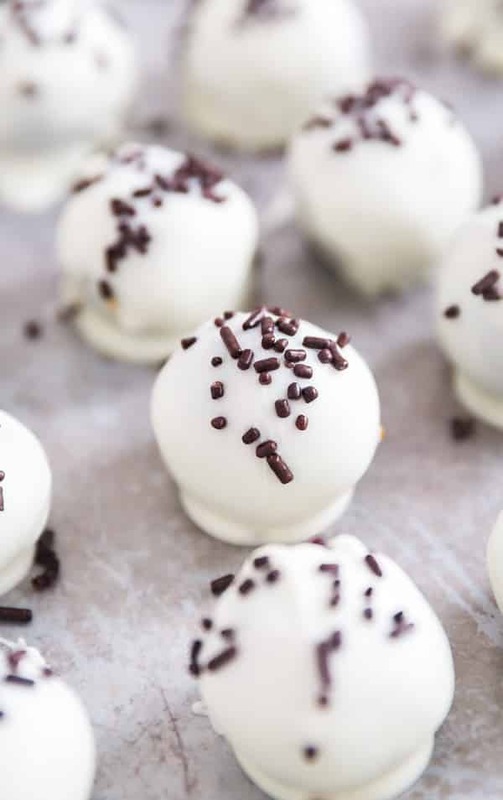 Melt some white chocolate (and make sure you check out my handy tutorial on melting chocolate in the microwave) and dip each ball into it to cover. Transfer it to a pan lined with wax paper and and sprinkle with some chocolate sprinkles (do this right away, the chocolate dries pretty quickly!). Chill them to set the chocolate and then eat up! Bake the cake as per the package directions but instead of the amount of water that they call for, substitute it for the same amount of Guinness. Once the cake has cooled remove it from the pan and place it into the bowl of a stand mixer with the paddle attachement or a mixing bowl. Run the stand mixer for a few seconds (or use your hands) to turn the cake into crumbs. Add the Irish Cream and and run the mixer for a few more seconds until it comes together with an almost dough-like consistency (or use your hands). 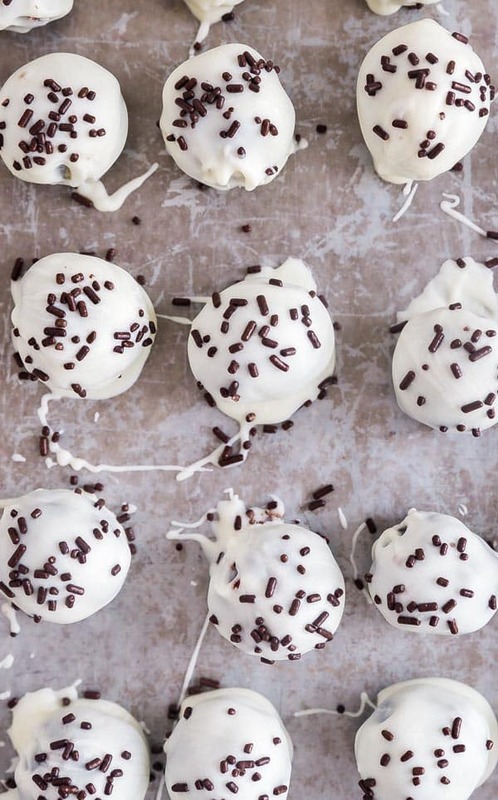 Roll the cake mixture into 1-inch balls and place them on a parchment-lined pan. Melt the chocolate in the microwave in two 30 second increments and then 10 second increments, stirring in between each time until the chocolate its melted and smooth (try to do one bag at a time because it solidifies fast). 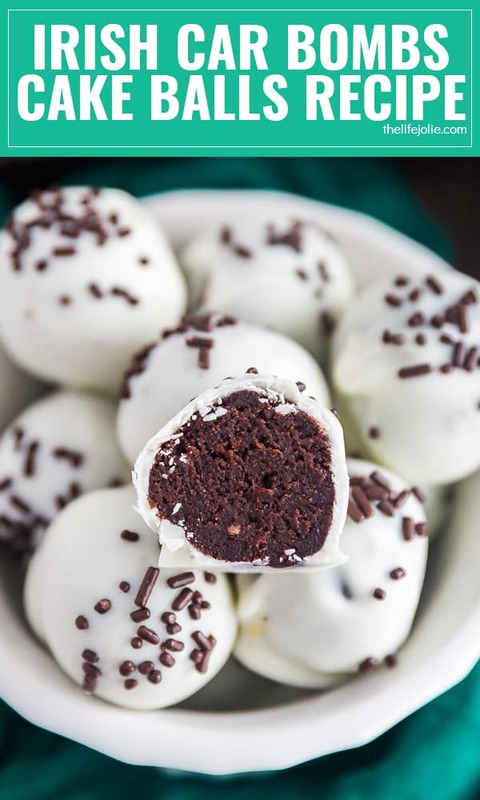 Using a fork, carefully roll each cake ball the melted chocolate and and transfer it to a wax paper lined pan. 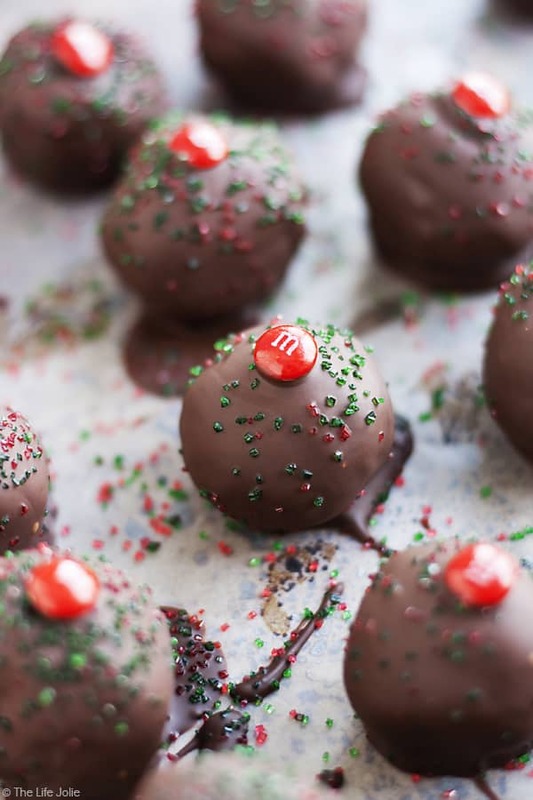 Immediately sprinkle chocolate sprinkles on top (act fast- it hardens really quickly. Chill to set and enjoy! These hold up well in the refrigerator for up to a week.